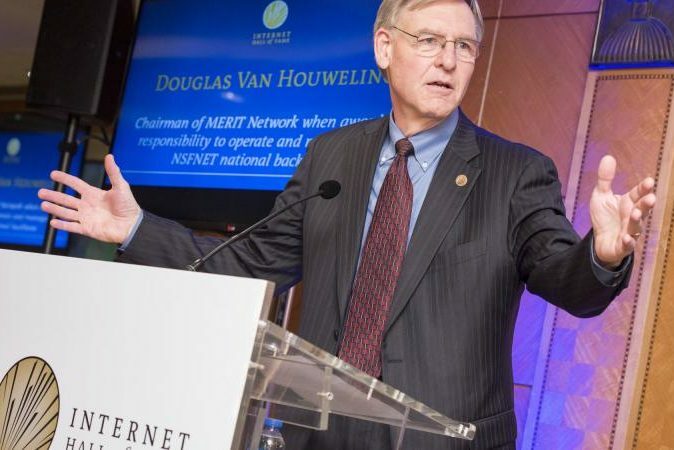 Douglas Van Houweling, UMSI professor of information, also known as the “Father of the Internet,” retired in April after a long, remarkable career at UMSI and U-M.
“I’ve been extremely fortunate to have played a role in information technology here at the university and nationally over the last 33 years,” Van Houweling says. “The university has enabled me to serve in a diverse set of roles as the IT revolution has unfolded. I am deeply grateful for those opportunities.” While Van Houweling may be retiring, he isn’t planning to move to some island in the South Pacific. He says he will continue to conduct research and to be engaged in some university projects. Francis (“Fran”) Blouin, Jr., professor of history and professor UMSI emeritus of information, was the long-time Director of Bentley Historical Library; he also led the Vatican archives project, a 20-year- long endeavor. George Furnas, UMSI professor of information, focused his research on human-computer interaction. He helped found the then-new School of Information in the 1990s. He has served as UMSI associate dean for academic strategy, and is an Association for Computing Machinery (ACM) Fellow. He helped pioneer collaborative filtering, invented latent semantic indexing and the theory of generalized fisheye views, among many other contributions.